Part of me doesn’t want to tell you that “Melancholia” is a movie about the end of the world. Chances are you’ll groan and stop reading. 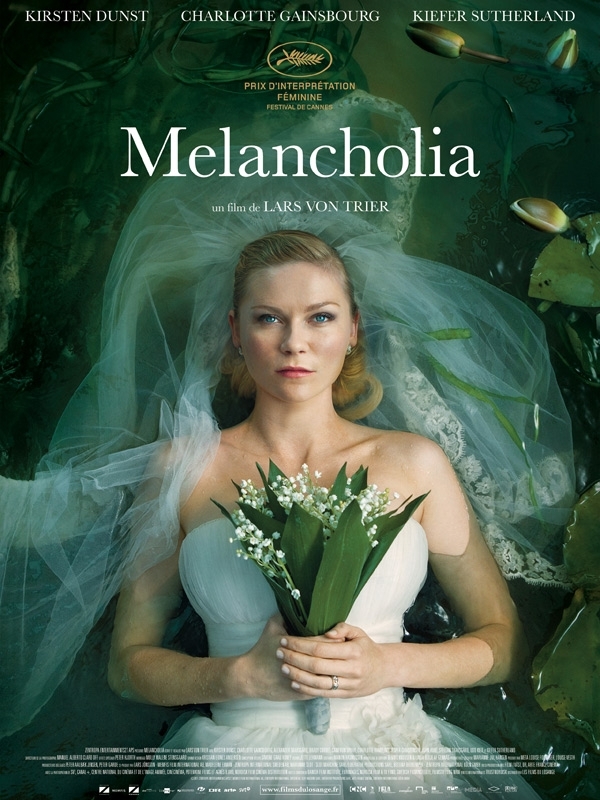 Maybe you’re right, because “Melancholia”, directed by controversial director Lars Von Trier, wouldn’t appeal to an audience seeking something fast paced or even action packed. Von Trier followers on the other hand will know exactly what they’re in for, and (if I’m not mistaken) will be more than pleased with what the movie has to offer. I wouldn’t call myself a huge fan of his work (I thought “Antichrist” was painful to watch), and I wasn’t exactly thrilled by his “Melancholia”. It’s a film I respect for sure, even though I found it very tough to sit through. That’s because Von Trier creates a palpable sense of unease—which is exactly what he sets out to do. To be completely fair though, the movie opens with a bang: the prologue blasts out Wagner’s Tristan and Isolde at top volume over a series of beautiful, surreal tableaux. Those wonderful images set out the tone to the sort of things we will be seeing and feeling over the next two hours. It’s a brilliant opening, unique, gorgeous, and almost dream-like (I wonder if he was inspired by Hitchcock’s “Vertigo”). But where the movie goes next is somehow disappointing. I shouldn’t reveal much; suffice to say that the first rate cast (which includes Kirsten Dunst, Charlotte Gainsbourg and Kiefer Sutherland) make the movie memorable and uncomfortable at the same time. I admire “Melancholia” a lot, which unfolds at a deliberately slow pace, but I can’t say I fully enjoyed it. One question was running through my mind the entire time: what does it all mean? To be honest, I’m not really sure. But I can tell you that at some point, I felt a great deal of compassion for the characters (keep in mind, this isn’t “Armageddon” or “Deep Impact”), and the climax sent shiver down my spine. If only the rest of the movie felt as brilliant and absorbing as its opening and closing scene. Too bad. I’ve never liked Lars Von Trier…after watching the painfully dreadful “Antichrist” i decided not to watch any of his movies anymore..but for some reasons Melancholia looked appealing to me (although I’m not a fan of those “out of nowhere” depression stories) so I watched it and I was actually amazed by the opening sequences…beautifully shot and brilliantly scored…but indeed, this was the only ” great part”. I can’t deny that it has quality but the script needed to be more polished. the story became less and less interesting as “the pages turn”, Dunst tried her best to portray her character, but it ended up a little bit hopeless on screen and not as complicated as they hoped.her lines weren’t strong enough to keep the viewer interested or curious, as a result, her scenes were repetitive and sometimes clumsy. visually speaking it was an ambitious movie but unfortunately it fell behind its clumsy dialogue. it didn’t deserve to be the movie that might ruin Von Trier’s career ( am talking about the disastrous press conference following its screening at Cannes) but as i said i can’t deny that it has quality and i respect Von Trier’s perspective. Couldn’t have said it any better! I think without its opening and closing sequence, the movie would have been a disaster. I respect Van Trier’s vision, but Melancholia is just not good enough. Oh and I still cant get over Antichrist. The hell was that? Antichrist was [simply] the most pretentious annoying selfish arrogant piece of crap of the past few years. it’s like him saying “I made a movie and you have to watch it” and (bcz of it) he called himself the best director in the word . I just..hate it. it is a great example of how ridiculously bad the use of shock elements can be. hahaha Amen dude! Couldnt stand it. I just wanted it to end already. Painfully unwatchable.